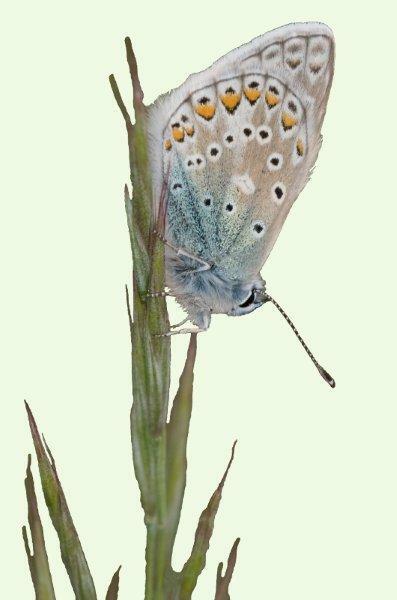 The male Common Blue has un-marked violet-blue upperwings, edged with a fine black line which is bordered with a clear (no vein marks) white margin. The female upperwings are brown with orange lunules at the edge, the amount of orange is less extensive that on a Brown Argus. The female can sometimes show a variable amount of blue on their upperwings. The underwing is similar to that of the Brown Argus but can be distinguished from it by the additional spot close to the middle of the forewing.